Pasta dishes are some of my favorite entrees and Spinach Mushroom Ravioli is incredibly easy and delicious. When I say easy, you can’t get much easier than this! I started with a Spinach Mozzarella Ravioli purchased at Costco. 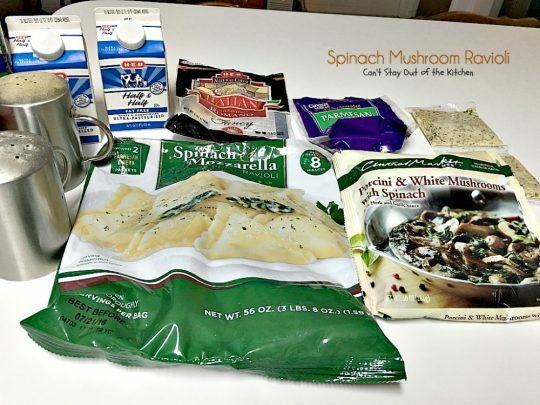 The Porcini and White Mushrooms with Spinach in Garlic Herb Sauce was purchased at H-E-B grocery stores which is a common grocery chain here in the Metroplex and Texas. I made up my own Al Fredo sauce using both Parmesan and Romano Cheeses, butter and half-and-half and seasoned with parsley. It was a warm and comforting dish that was very satisfying and tasty. I found the two main items for this recipe at different times and stashed them in my freezer. A couple of weeks ago, I was really in the mood for some pasta. So I thought I would throw them together and see what I could come up with. I really wasn’t planning on posting this, but it turned out so well I’m glad I took a few pictures along the way. 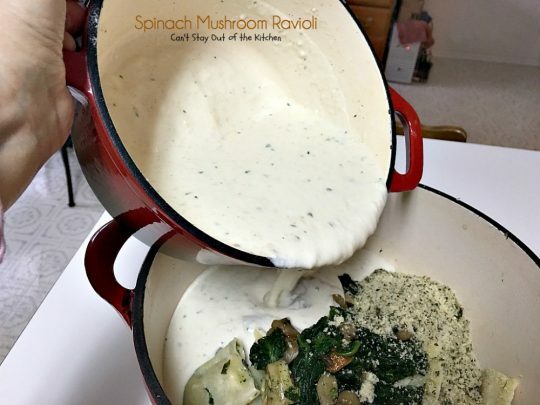 Unless you live in Texas or the southwest I’m not sure you will have access to the frozen Porcini and White Mushrooms with Spinach in Garlic Herb Sauce. While some of you may be able to concoct your own imitation of these veggies, it obviously would be so much easier to purchase the packages that H-E-B sells. Central Market actually makes the mushrooms. 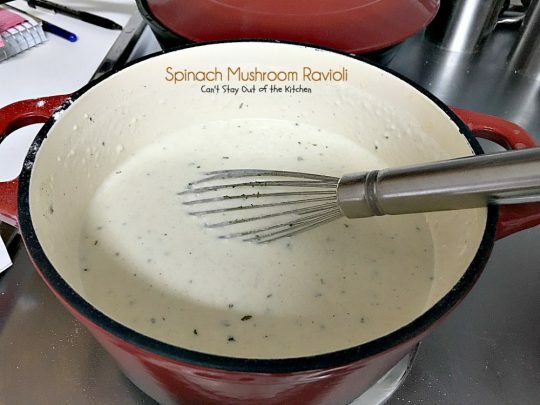 One recommendation: the garlic herb sauce that the mushrooms come in provides a good bit of garlic flavor. I loved the addition of garlic powder, but unless you really enjoy a lot of garlic in your recipes, you may want to eliminate that ingredient. Spinach Mushroom Ravioli uses three cheeses, mozzarella in the ravioli, and both romano and parmesan in the al fredo sauce. 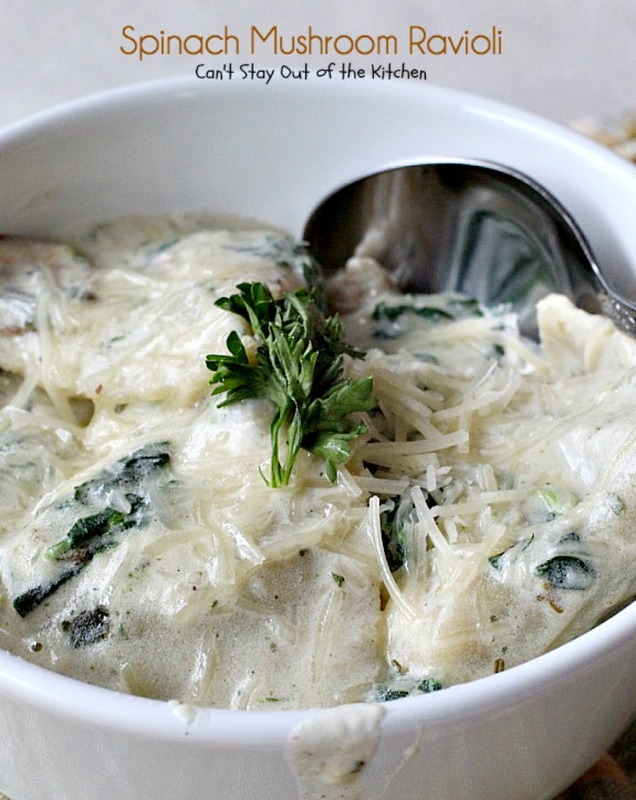 It makes a very rich, meatless pasta dish which is great for Meatless Mondays. 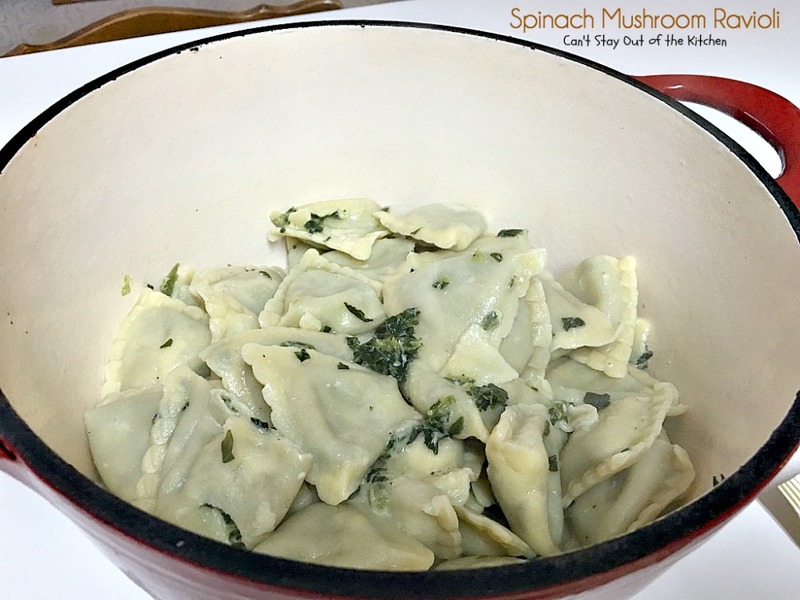 If you want a quick and easy pasta main dish and are able to locate the ingredients for this recipe, Spinach Mushroom Ravioli is a cinch to make and delectable to the taste buds. 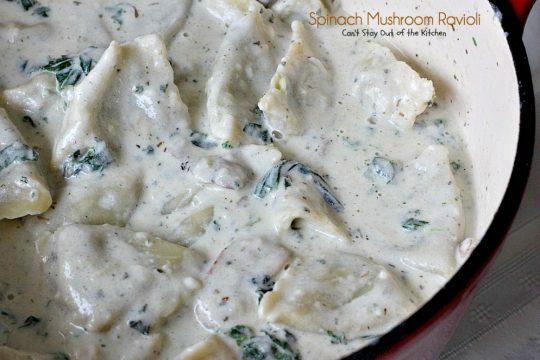 Spinach Mushroom Ravioli is a quick and easy pasta dish you’re sure to enjoy. 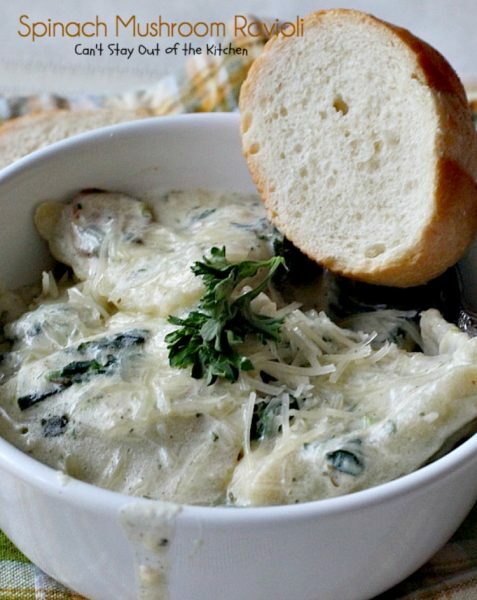 Garnish Spinach Mushroom Ravioli with additional parmesan cheese, if desired. You’ll be drooling after one bite of this savory and sumptuous dish. I used these ingredients. I purchased the ravioli at Costco and the mushrooms at H-E-B. Bring water to a boil. Add ravioli and bring to a boil again. Cook an additional 4 minutes. Drain. 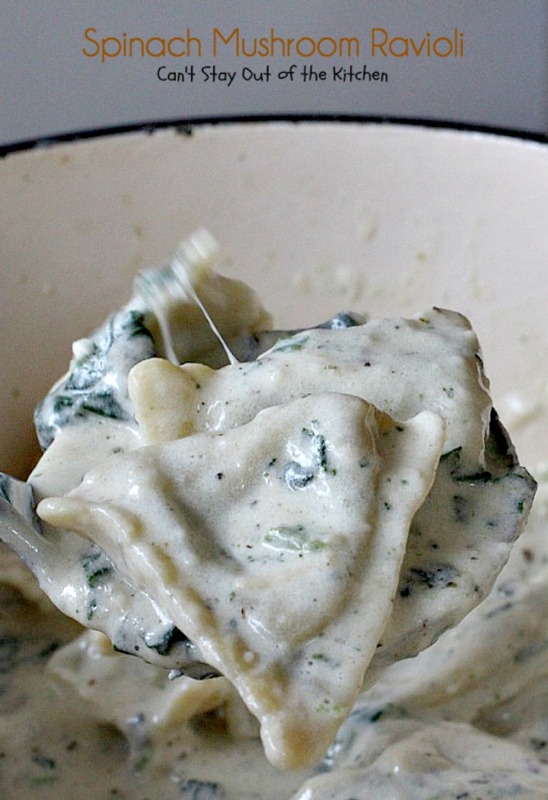 While ravioli is boiling, make al fredo sauce. Melt butter. Stir in flour with a whisk. Add half-and-half about an eighth of a cup at a time until all is whisked into the sauce. Add cheeses. Season with salt, pepper and parsley. Allow to cook over low to medium heat about 5 minutes until the sauce thickens. Remove from heat. Set aside. Drain pasta water from pot. Microwave the mushrooms about 4 minutes on high. 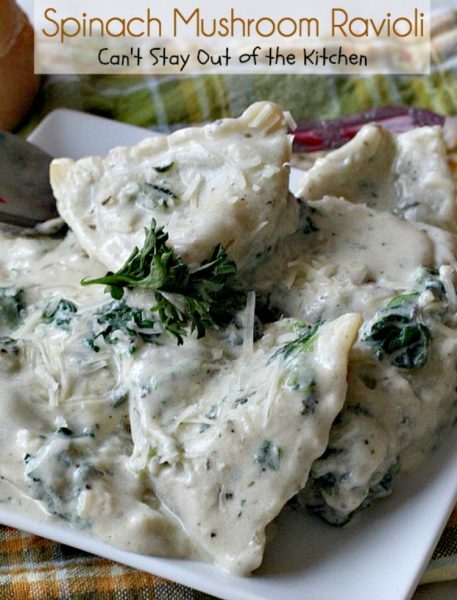 Add to ravioli with the herb seasoning packet. Add al fredo sauce and stir gently to combine. The sauce will absorb into the pasta the longer it sits out. 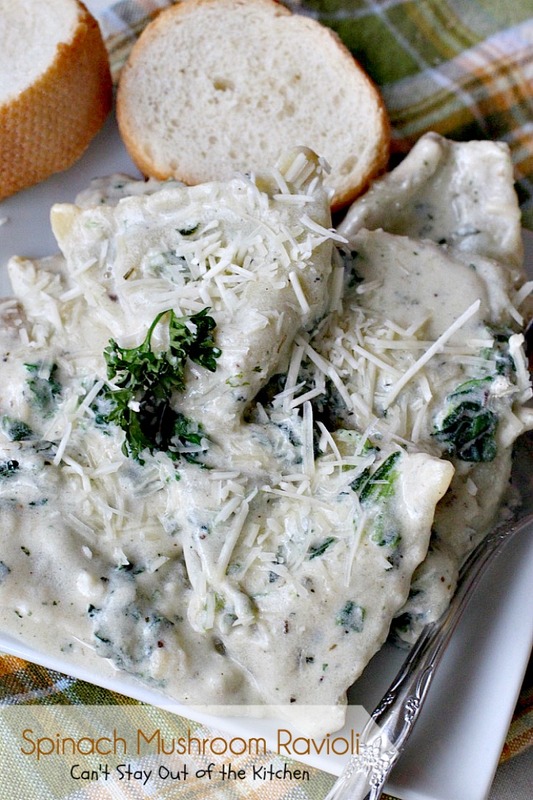 Spinach Mushroom Ravioli is amazing. 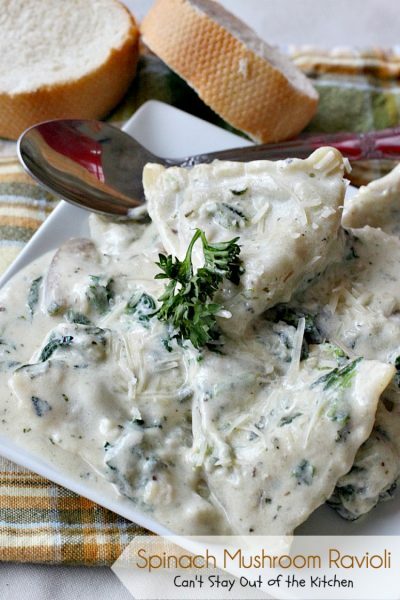 This recipe actually uses three cheeses: mozzarella in the ravioli, plus parmesan and romano in the al fredo sauce. 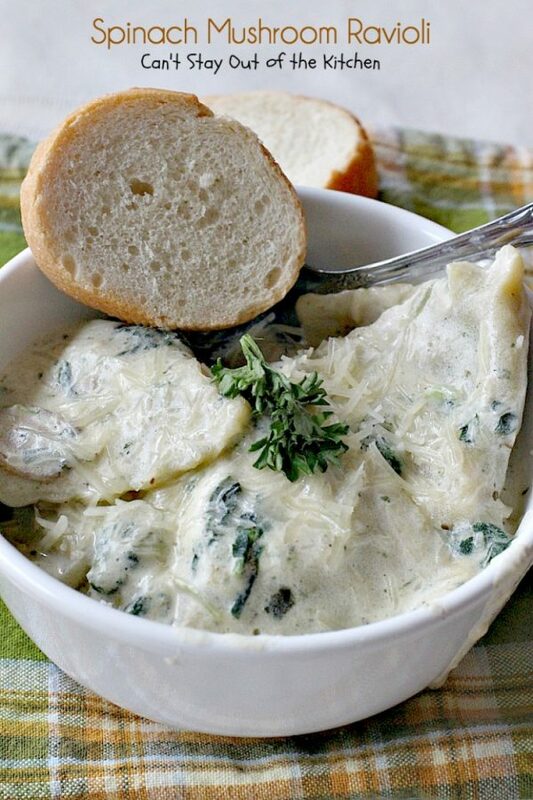 Serve Spinach Mushroom Ravioli with your favorite bread or rolls. 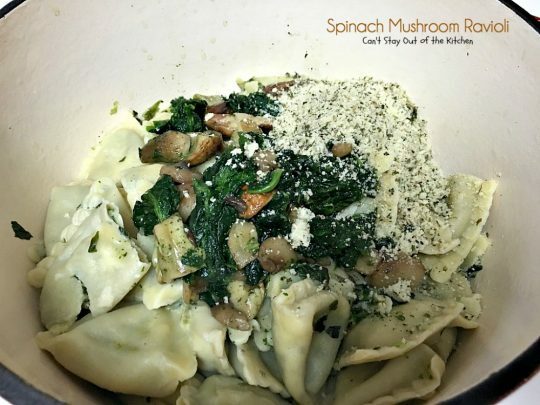 This fabulous pasta dish is filled with three cheeses, spinach and two kinds of mushrooms in a garlic al fredo sauce that's succulent and amazing. Quick and easy, too. Fill a large Dutch oven or stock pot about half to two-thirds full of water. Add ravioli and cook 8 minutes. Meanwhile, microwave mushrooms with spinach about 4 minutes on high. Add flour and whisk until all the flour is incorporated. Add half-and-half about ¼ cup at a time until all is incorporated. Add salt, pepper, garlic powder (if you desire extra garlicky taste) and parsley. Allow sauce to thicken over low to medium heat about 5 minutes or so. Add cooked mushrooms, herb packets and cheese sauce and stir to combine. Sprinkle with additional salt and pepper and parmesan cheese, if desired. 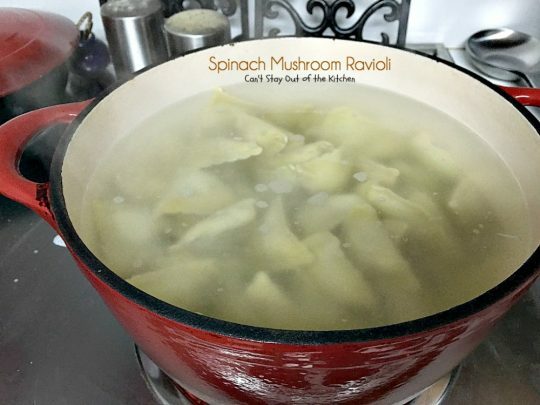 NOTE: I found the ravioli at Costco, and the mushroom/spinach in the vegetable freezer section at H-E-B grocery stores. NOTE: You will need to use half-and-half or cream to get the right texture for this sauce. NOTE: Once I added the frozen ravioli to the boiling water, it took almost 8 minutes to get it back to a rolling boil. I boiled it another 4 minutes before removing from heat. NOTE: The mushrooms are in a garlic herb sauce, so you may not want to add additional garlic powder. 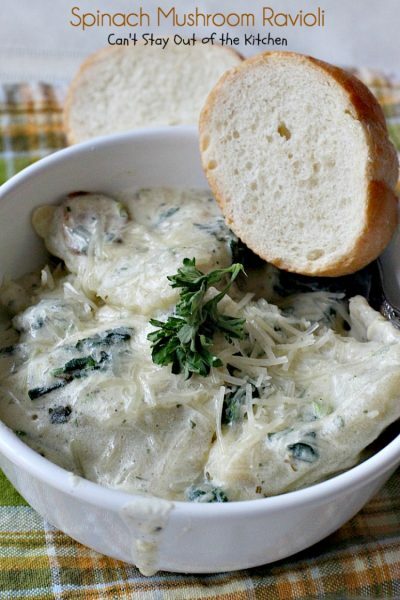 This fabulous pasta dish is filled with three cheeses, spinach and two kinds of mushrooms in a garlic al fredo sauce that’s succulent and amazing. Quick and easy, too. I found the ravioli at Costco, and the mushroom/spinach in the vegetable freezer section at H-E-B grocery stores. [br][br]You will need to use half-and-half or cream to get the right texture for this sauce. [br][br]Once I added the frozen ravioli to the boiling water, it took almost 8 minutes to get it back to a rolling boil. I boiled it another 4 minutes before removing from heat. [br][br]The mushrooms are in a garlic herb sauce, so you may not want to add additional garlic powder. This makes a great recipe for Meatless Mondays. Spinach Mushroom Ravioli is quick and easy when you have very little time to prepare dinner. Teresa, have I told you pasta is right up there with chocolate? <3 I love all the ingredients too! Pinning for later for sure. Thanks, Kim. I hope you can find the ingredients. It is certainly worth making.